For all things Micrographic plus Book/s & Large Format Engineering, Architectural plus other types of Drawing/s, Map/s & Plan/s & Fragile Archival Document Scanning - Imaging Equipment. Servicing Australia - New Zealand - PNG & the Oceania market with On Demand - Walk-Up Digital Microfilm Viewers, Readers, Scanners & Printers plus Book/s & Large Format Engineering, Architectural plus other types of Drawing/s, Map/s & Plan/s & Fragile Archival Document Scanning - Imaging Equipment. Do you or your organisation need total & complete functionality from the Micrographic or Book & Fragile Archival Document Scanning Equipment ? 2016-NOVEMBER: How are the German Archives protecting their German Cultural Heritage Collection Material from war and natural disasters? With Tried & Proven for around 100 Years – Microfilm, of course !!!!!! LATEST NEWS: Digital Scanning & Microfilm Equipment – DS & ME is pleased & VERY EXCITED to be able to announce that based on its EXCEPTIONAL SUCCESS over the past ELEVEN – 11 YEARS with the installation of FIVE HUNDRED & FOURTEEN – 514 of On-Demand Walk-up Digital Microfilm Reader, Viewer, Scanner & Printers across Australia - New Zealand – PNG & Oceania that Crowley – Wicks & Wilson Limited of the United Kingdom has seen fit to appoint DS & ME as a Reseller of their UScan+ Universal Microfilm Scanner Range with Colour Capabilities, the UScan+ HD and +HD LTE models of Crowley – Wicks & Wilson Limited’s On-Demand Walk-up Digital Microfilm Reader / Viewer / Scanner / Printer with the NEW 18 Megapixel Active Pixel Sensor Array. Well 2019 is here with a RUSH & Digital Scanning & Microfilm Equipment – DS & ME is moving onward & upward with its Digital Microfilm Reader / Viewer / Scanner / Printer offerings to our current & prospective clients located in the Australian, New Zealand, Papua New Guinea & Oceania market. Laurie Varendorff the Managing Director & CEO of DS & ME has been involved with the marketing, installation & ongoing technical support of the Wicks & Wilson Limited range of micrographic equipment for the past TWENTY SEVEN-27 years with the first installation of the Wicks & Wilson Limited’s 35mm Aperture Card Scanner with the Water Authority of Western Australia in 1993 & its replacement with the Wicks & Wilson Limited model 3600 – 35mm Aperture Card Scanner in 1998. 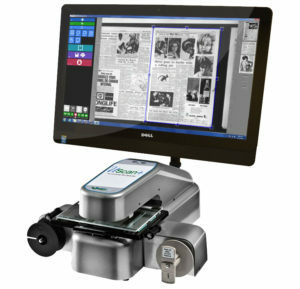 Since Digital Scanning & Microfilm Equipment – DS & ME commenced operations in 2004 DS & ME has installed numerous of the Crowley – Wicks & Wilson Limited model C-250 – 400 – 35mm Aperture Card Scanners plus the model 7750 Microfiche Scanner into the Australian, New Zealand, Papua New Guinea & Oceania market. A YouTube Video of the UScan+ UF-Series Digital Microfilm Reader / Viewer / Scanner / Printer in operation for the scanning of all microfilm formats plus other Photographic materials e.g. Microfilm – Microfiche – Jumbo fiche – Ultrafiche – Aperture Cards – Micro Cards / Micro Opaques – Photographic materials (slides, negatives, etc.) & 35mm perforated films is available for your review below. DS & ME have stock of the UScan+ UF-Series Digital Microfilm Reader / Viewer / Scanner / Printers on order & in transit. With many years of experience in the micrographic, microform, microfilm, & microfiche imaging [ both film & digital ] technology & the industry Laurie Varendorff, DS & ME is well placed to understand the microfiche & microfilm & more recently book scanning, digitising & reading – viewing requirements of the Archive, Library – Public, Special Purpose, University & Reference, Genealogy, Preservation, Conservation, Local Studies & Local History areas & be able to provide the most suitable equipment & consumables available to meet those requirements. DS & ME is capable of fulfilling your equipment & consumable requirements for 35 mm Aperture Cards for Engineering, Architectural plus other types of Drawing/s, Map/s & Plan/s, Jacket/s, Microfiche, Microfilm & Book plus Large Format & Fragile Document Scanning production plus viewing, reading, scanning, digitising, digitizing, imaging, printing & any other micrographic & book scanning needs, now & into the future. The marketing, installation & ongoing support of digital microfilm equipment & especially aperture card, jacket, microfiche & microfilm Reader – Printer Scanners plus the recent addition of a range of book scanners is our organisations specialty. With a currently comprehensive & growing list of international and nation partners ( both manufactures and sub distributors ) DS & ME are in a position to provide for the current rejuvenation in the area of digital 35 mm Aperture Card/s for Engineering, Architectural plus other types of Drawing/s, Map/s & Plan/s, Jacket/s, Microfiche & Microfilm equipment plus the recent addition of book scanner installations & support including digital microfilm Reader – Printer Scanners & consumable utilization across Australian – New Zealand – Papua New Guinea & South Pacific at a time when there is resurgence in the use of microfilm & microforms in general as an archival storage media & a need to convert physical books to a digital format. This resurgence of microfilm & microforms in general in the Archive area is in addition to microfilms & microforms in general continuing use in its areas of strength in the Library – Public, Special Purpose, University & Reference, Archive & Records Management, Heritage, Museum, Preservation, Genealogy, Local Studies plus Family & Local History areas & with related professional & amateur institutions & organisations which has been added to by the recent addition of book scanning equipment availability to this same market segment serviced by DS & ME. USAGE TIPS : To search for a term or details on this webpage press the “CTRL” and the “F” keys – at the same time; then type in the term or details you are searching for in the Find: search window box. If the term or details are located on this webpage you will be taken directly to the first occurrence of your searched term or details. You can then navigate to additional occurrences of the term or details ( if they exist ) by clicking on the Next Button. For any form of microfilm aperture card, jacket, microfiche, microfilm – 16 / 35 mm Roll, micrographic & microform requirements, no matter how small or complex, please contact us via the Contact Us @ DS & ME facility at this website or email Laurie Varendorff at – Digital Scanning & Microfilm Equipment – DS & ME - Email: Laurie Varendorff & we will do everything in our power to fulfil your requirements. For any book, drawing, map or plan plus archival document or fragile material no matter the size – e.g. less than A 5 = 148 x 210 mm = ( 5.83 x 8.27 inches ) or up to Double A 0 Plus = 2,000 x 1,210 mm = ( 78.7 x 47.64 inches ) – which requires Scanning, Digitising = Digitizing & or Imaging for your Digitisation Projects, no matter how large or small then contact Laurie Varendorff @ email @ Laurie Varendorff ARMA; or Phone: Australia @ 0417 094 147 – International @ +61 417 094 147 at Digital Scanning & Microfilm Equipment – DS & ME.